It's no secret that cows love to spend their days grazing in a grassy meadow, but evidently they love listening to music even more. 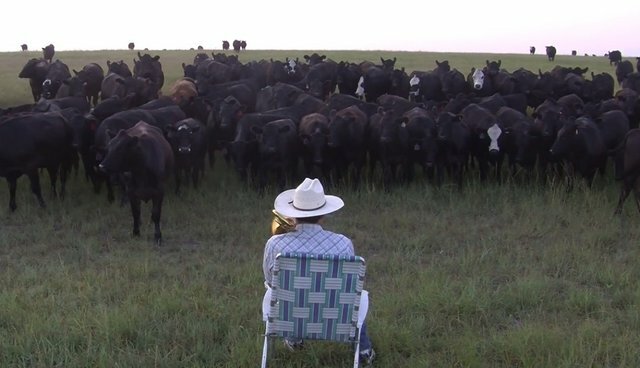 From time to time, Derek Klingenberg likes to head out into the field to serenade the happy herd of cows on his farm in Kansas with some impromptu musical performances. The farmer's latest number, this trombone rendition of Lorde's 2013 hit "Royals", was a clear favorite among the blissful bovine who, like a horde of starstruck teenagers, came rushing in to watch him play. The reason? Well, they probably find music as relaxing as we do. "It seems that slow music had the effect of alleviating stress and relaxing the animals, which resulted in greater milk yields," said psychologist Adrian North, one of the study's authors.